Though I’ve always been a runner (or at least since the Girl Scout Olympics in elementary school), it was not until my 30’s that I became a marathon runner. I had been wanting to run a marathon for quite some time. 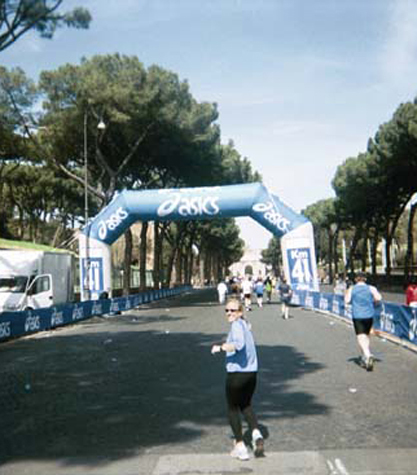 A marathon, to me, is something that is do-able, but not immediately or all at once. It is something that requires training, practice, and sustained effort over time. I tend to be more of a ‘if I can’t do it immediately why bother doing it’ person in many respects, so I had always thought a marathon would be a good discipline for me, an example of something that, poco a poco, could be accomplished by setting your mind (and training schedule) to it. I’ve now got 3 marathons under my Asics, so to speak. Rome (which is not a bad first marathon), Belfast (including a nice scenic path by the city dump) and New York (which I ran in honor of my dad and to raise money for the Labrecque Foundation). But in each of them, though I trained (and found out that I’m actually quite a fundamentalist when it comes to a running training plan) and though I finished, I never felt all that great (of course not, you might be saying) and wished that I could have finished stronger. Around the time that I was toward the end of my training for Belfast a friend introduced me to” target=”_blank”>Chi Running. Though I liked the idea of it (learning to allow gravity to power your running, rather than seeing running as a struggle) and though I tried to implement it, I was far along in my training and the chi running fell by the wayside. So, while in Manila, I finally bought the Chi Running. book, a new pair of running shoes (I hadn’t even brought mine with me on the trip, that’s how little I was running) and put my good intentions back out on the course. 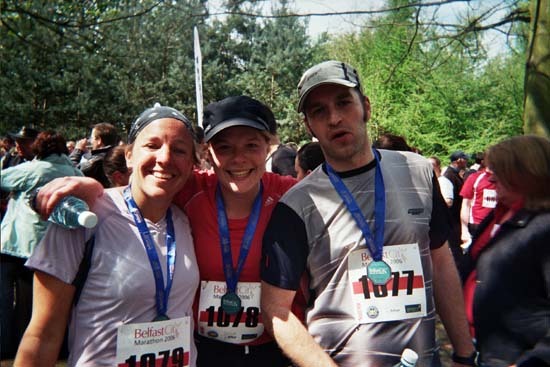 I still had the desire to run another marathon. I still struggled with that ‘niggle’ in my right side whenever I would run. So, I just sort of trudged along, not really running, but not really ready to give it up either. ” target=”_blank”>Born to Runis the story of the Tarahumara, an indigenous tribe of ‘running people’ in northern Mexico. It’s also the story of ultramarathoning, trail running and barefoot running–telling the story in such a way to make both sound unbelievably compelling. So I tried it. Not the ultramarathon part (yet). But the barefoot part. I don’t have any of those fancy” target=”_blank”>Vibram Five Fingersshoes (yet), but I do have a beach, and a pair of free-washed-up-with-the-tide-fake-crocs. So I put on my running kit (a phrase I picked up from the UK, meaning ‘running outfit’ which doesn’t have nearly the same ring to it) and the washed-up-with-the-tide-crocs and walked down to the beach during low tide. I ran. Maybe it was psychological. Maybe it was the influence and inspiration of Born to Run that had not yet worn off. But I ran. I felt great. No niggle in the right side. Just me, the beach, the waves (and Tigger). It felt so good that I did not want to stop. But, remembering what happened to Forrest Gump, I figured I’d better start gradually. So, we’ll see how it goes. I’ve ‘barefoot run’ along the beach a few times now. So far so good. I’m probably still a wee bit away from a barefoot ultramarathon trail run, but, poco a poco, who knows? It is with sadness that I write. I did run and finish the marathon on Sunday. On Monday, as I was hobbling my way through New York City, I got a call that Jack McClarty had been hospitalized. I was able to get a flight home on Monday night in order to be with Martha and the family. Jack passed away early yesterday morning, November 7, 2007. Each day before the marathon I had been talking to Jack on the phone, giving him the status updates on my ‘niggle’ and how I thought the marathon would go. The night before the race he told me to run well, and not to go out ‘honky tonking’ so I could get some rest. I told him I would not ‘honky tonk’ since I was not sure what that meant anyway! He had also been giving me the status reports about the garden—it is his and Martha’s backyard where Tommy and I have been gardening these past months, an intermingling of growth and new life in the midst of letting go and passing of life. On Sunday, after the marathon was over (I did it in 4:35:13, by the way, and have some pictures on edunny.com) Jack called to congratulate me. He had been charting my progress at each 5K and had plotted it on a graph, he told me, that he would show me when I got home. He also pointed out that my pace had slowed significantly at the end, which I thanked him for rubbing in. An engineer, he had spreadsheets for everything and though we did not know it, this was to be his last. Running for four and a half hours through New York City gives you a lot of time to reflect. 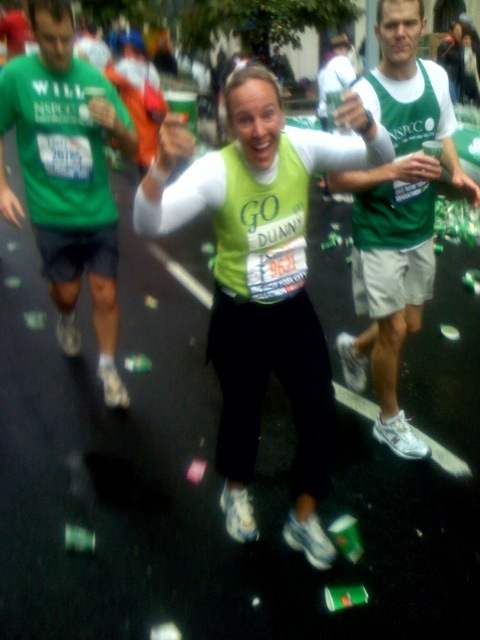 At one point, running through Manhattan, I thought of how proud my dad would have been, cheering me on. I thought of Jack who was tracking the race from afar via computer, and whose cancer had gained the upper hand. Along the route itself friends had calculated the best spectating places and were there to cheer me on at mile 8 and 14.5 (in Brooklyn) again at mile 16 (in Manhattan) and at mile 23 along 5th Avenue and into Central Park (I guess the tendency toward over-detail runs in the family). I had written my name on my running jersey so as I ran through the various boroughs of New York City I heard “Go Dunny!” shouted all along the way, in a variety of accents. At mile 15 I thought I was not going to be able to finish. My leg was hurting, I had a side ache, and I was ravenously hungry. All I wanted to do was lay (or is it lie? Jack would be correcting me!) down on the ground. But as I came off the bridge and looked at the sidelines I saw friends there to cheer me on, and knew that there would be more friends a few miles on, it was as if a new energy lifted me up and kept me going. I ran with Mason, a friend of a friend. When I was feeling weak, he kept me going. When he thought he could not finish, I didn’t let him quit. We both said we could not have finished without the other. The thing is, in running a marathon, and I think in life too, it makes a difference to have others who run beside you and keep you going when you think that you can’t take another step. It makes a difference to know that there are those who love you and who are cheering for you, encouraging you along the way. Jack was one of those people in my life, and I will miss him terribly. But I also know that his life and his spirit will live on in the lives of those he knew and loved. It’s official—I picked up my NYC marathon number yesterday, F9621. I’ve been battling a bit of a niggle in my right leg, but thanks to Dr. Williams, the chiropractor my friend Kelley recommended, I should be ready to go. If you wan to track my progress, apparently on the marathon’s website (www.nycmarathon.org) you can enter F9621 and get my progress on a map. Or, if you’d like to have an email update sent to you every time I cross 5K (about 3 miles) let me know and I can sign you up for the email alert! The marathon is on Sunday and starts at 10:10AM. For those who are in the NYC area, I would love to have any cheerers I can along the route! I am going to take a camera with me while running (disposable—the camera, not the running) so hopefully I’ll have some pictures from the race posted. I did stroll through Central Park yesterday and saw the finish line, so I can have that vision in mind when the legs get sore (hopefully not in the first few miles). Thanks again for all of the encouragement and support—and by the way, because of all of you I’ve raised over $4300 for lung cancer research—way to go! It’s a good thing that I can type with my hands and not my legs (probably for many reasons) because I can tell you that after doing a long run today my legs are stiff, sore, and as Tommy says, just plain “weared out.” Aside from the post-run tiredness, in other marathon news I have been truly overwhelmed by the amazing support from so many of you (for the rest, there’s still time…just kidding, I mean, there is still time, but kidding about the pushy salesperson part) and I am happy to say that I have reached the $2500 point! Not only does that mean that the Labrecque Foundation gets that much more money to help research and hopefully cure lung cancer, but it also means I don’t have to take up a side job as a street preacher with a collection jar in front of me. Speaking of preaching (talk about a segue), I preached to the choir again a few weeks back. This is the same small, struggling church in Long Beach where I preached this summer and where there were more people in the choir than the congregation. This time the congregation had three times as many people as the choir! But unfortunately that’s just because the choir’s down to 5… The text was the story of the Good Samaritan (Luke 10: 25-37) and though you can’t listen or read it (they don’t tape and I was practicing my ‘preaching without a manuscript’ skills) the question I posed to them was one of wondering if the priest and the Levite (if you don’t know who I am talking about sorry, you’ll have to read the story) did what was logical, practical and almost to be expected (what I might do? )…and if it was the Samaritan who did the unheard of act. If he was the good guy in the story, what does that mean for us and our lives? Speaking of life reminds me of the garden. The good news is that the lettuce is going strong as are what I am affectionately calling “the world’s largest cherry tomato bushes.” The bad news is, apparently the gardeners (the paid kind) thought the pumpkin and Crenshaw melon patches were just a bunch of dead leaves (which they were) and tore them out, leaves, melons, pumpkins and all…the worst was that one of the 3 “Thanksgiving” pumpkins was just starting to turn orange and look like we might actually get our pumpkin pie from our very own garden. Tommy (7) seemed to rebound better than the rest of us from the tragedy, though he also lost his ‘stick pile’ in the destruction. Speaking of stick piles, actually, that one doesn’t work… Anyway, the other tidbit to share is that I have links to new photos. These are photos from the Ecuador Photo Project that I helped teach this August (you can see pictures of the students themselves, their work, and pictures from our ‘exhibit’ on the concrete soccer field) as well as the LA Photopiece that I helped to teach this summer (you can see pictures of their work). It has been really fun to be involved in both of these opportunities to combine my love of photography with a desire to spend time with students and help them find their ‘voice’ and realize that they have something to say to the world about their world. This Sunday is considered World Communion Sunday and Christian churches around the world will all be sharing in communion (Eucharist, Lord’s Supper, depending on your tradition) together. As part of that, four of the churches that participate in the Ecuador trip will all be displaying exhibits of the Ecuadorian students’ work, hung on clothes lines, with clothes pins. If you are anywhere near Branford or Hartford Connecticut, or Monson or Weymouth Massachusetts, you should go by and see! If you are somewhere else and you know of somewhere to show the work locally, let me know! Oh, and not to be negligent on my weather reporting, we actually had rain in Southern California a few weeks back! The first of the season, and according to the rain gauge, 1.5 inches overnight! I have been thinking a lot about death lately. Makes you want to invite me to your next cocktail party, huh? On September 5 my grandma, Winnie Kerr, 93, passed away. Today, September 10, is the 3-year anniversary of my dad’s death. September 11 is obviously remembered, and it seems hard to believe that six years have passed. September 12 is the anniversary of the death of my good friend’s sister. That’s a lot of death in a one week span. Even when death is almost a blessing, as with my grandma who was older and from whom life had begun to slip away, it is still hard to deal with. (I know, grammar police, that’s a preposition at the end of my sentence but ‘it is hard with which to deal’ just seemed a bit cumbersome.) Even when death becomes, in a sense, expected, as with my dad, it can still be a shock that feels as though it tears away your very foundation. I realize this is a bit heavy for a Monday morning, what happens to be a beautiful sunny Monday morning in Newport Beach. I don’t want to dwell on death and wallow in it. But I do want to take a moment to honor those who have passed away, to be thankful for their lives, and to appreciate my own life as well. On November 4 I will be running the New York City Marathon to raise money for lung cancer research (lung cancer is what my dad died of). I am running with a charity called the Labrecque Foundation, named after Thomas Labrecque, CEO of the Chase Manhattan Corporation, who was diagnosed with lung cancer and died 8 weeks later. I have agreed to raise $2500 which gives me the opportunity to drag myself 26.2 miles around New York City. All of the money raised goes to the charity—I even have to pay my own marathon entrance fee to run. If I don’t raise the $2500, not only do I get the privilege of running that far, but I also get to pay a pretty penny to do so! I would love it if you would like to donate. Don’t feel obligated. Honestly. There is no pressure here. But, if you do want to donate, you can do it in one of two ways. (I have to raise all funds by mid-October).